Recording professionals around the world rely on M-Audio Studiophile reference monitors for exceptional sonic accuracy. The Studiophile BX5a Deluxe monitors update the bestsellers with new waveguides and enhanced driver integration for a cohesive and refined sound. 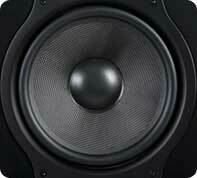 The 5-inch low-frequency driver cones are crafted from Kevlar, an extremely resilient material. Curved cone design coupled with high-temperature voice coils and damped rubber surrounds deliver excellent fidelity and durability. The 1-inch waveguide-loaded, high-frequency drivers are made of magnetically shielded silk domes for a crisp top end that's gentle on the ears. 70-watt bi-amped power and expertly tuned crossovers round out a first-rate pair of reference monitors with a footprint small enough to fit just about anywhere. A first-rate pair of reference monitors with a footprint small enough to fit just about anywhere. Click to enlarge. XLR or 1/4-inch TRS inputs. Kevlar drivers with rubber surrounds for accurate reproduction. 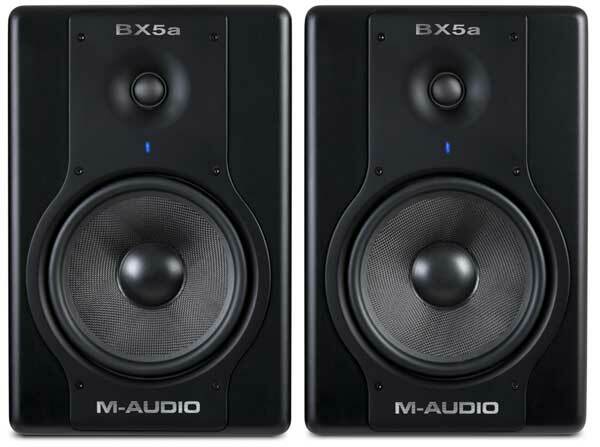 The Studiophile BX5a Deluxe monitors update the best-selling M-Audio BX5a system with a variety of enhancements. The updated waveguide delivers excellent imaging. A new low-frequency transducer provides well-defined bass. Custom amplifier tuning enhances the integration between the high and low frequencies, delivering refined spectral balance and a smoother response. An elegant new industrial design completes the package. 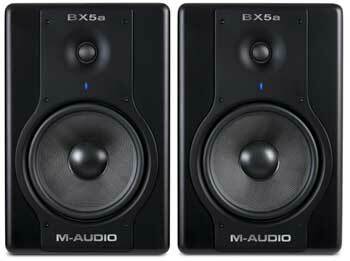 M-Audio's Studiophile BX5a Deluxe monitors employ Kevlar for low-frequency driver construction. Kevlar's high mechanical and thermal resilience makes it ideal for use in speaker cones. Our engineers also created a curved conical design that improves room dispersion. High-damping reliable rubber surrounds provide percussive musical bass, and also insure that the cone reaches its optimal excursion for accurate reproduction. Our high-frequency domes are made from natural silk to counter the high Q ringing that's inherent in the poorly crafted metallic materials commonly found in other monitors. In addition, our new waveguides refine the high-frequency response. M-Audio's FerroFlow technology uses ferrofluid liquid cooling to dissipate heat for maximum efficiency and extended usage. Active monitors have a distinct advantage over unpowered monitors because the built-in power amps are designed to work with the drivers and crossovers in a tuned system. Bi-amplification further refines the concept by dedicating separate power amps to the highs and lows. Combined with a finely tuned crossover, this design insures that both the high- and low-frequency drivers are asked to deliver only the frequencies they are most efficient at reproducing. The BX5a Deluxe monitor's cabinet is integrally designed with its other components for optimal performance--right down to rounded corners for reduced edge diffraction and superior imaging. Custom rear-port design audibly reduces the turbulence and resulting distortion caused by poorly designed ports. Unchecked, the electromagnetic waves emanating from your speakers can wreak havoc with your computer's video monitor or a nearby TV. The Studiophile BX5a Deluxe monitors are magnetically shielded so all of your electronic equipment can coexist on your desktop without interference.